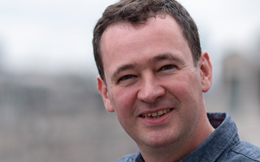 Dougal is Video Innovation Journalist at BBC News – the only role of its kind in the organisation. He has a roving portfolio, with a mission to find original feature stories that will have a big impact on digital platforms. He works within the BBC Business Unit creating digital, radio and TV reports. He started out as a researcher, then producer, on the BBC’s Hardtalk interview programme in the early 2000s, but slowly learned how to shoot and edit himself. He embraced ‘mojo’ three years ago, starting to film all his reports on a smartphone – this was after undertaking a ‘mojo diet’ to see if this could work for him. He hasn’t looked back since and his biggest hits (like Circular Runways and Sweden’s Recycling Shopping Mall) have clocked up millions of hits on social media platforms. Most recently he has worked on the BBC’s solutions-focused journalism strand World Hacks, where he developed a workflow that allowed him to simultaneously digital video, TV and radio reports simultaneously on his iPhone.